Rep. Jack Murtha (PA) came out this week with a headline-grabbing stand which calls for the immediate withdrawal of our troops from Iraq. His statements resulted in a hailstorm of harsh criticism from the right. In fact, much of the reaction has been standard attack and smear tactics by a despicable bevy of Republican chickenhawks. The mud and sleaze that has become the Republican weapon of choice has been fully unleashed. What's ironic is that Murtha's been one of those political untouchables. A hawkish Democrat war hero with a highly decorated 37-year career in the U.S. Marine Corps. He volunteered for Vietnam in '66-'67 and received two Purple Hearts and a Bronze Star with Combat "V". Retired from the Marine Corps Reserve as a colonel in 1990. Awarded the Navy Distinguished Service Medal by the Marine Corps Commandant when he retired. Well-respected by both parties for his first-hand knowledge of military and defense issues, of which he has dutifully served and advised both Republican and Democratic presidents. One of the most effective advocates for a strong national defense. A ranking member and former chairman of the Defense Appropriations Subcommittee. This rare combination of experience enables him to understand defense and military operations from every perspective. So when Murtha opens his mouth to speak, everyone listens intently. Which is why Murtha's become the man of the week by saying "Our military's done everything that has been asked of them. The U.S. cannot accomplish anything further in Iraq militarily. It's time to bring the troops home." 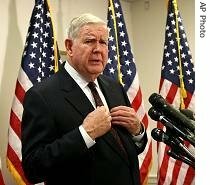 Murtha believes that the longer we stay in Iraq the worse we make the situation: "It is evident that continued military action in Iraq is not in the best interest of the United States of America, the Iraqi people, or the Persian Gulf region." Critical of Bush and Cheney, he claimed the war was "not going as advertised," and said the U.S. should make it clear to the transitional Iraqi government before the December 15 elections that our troops will be departing. Murtha's been a key Bush ally on the Iraq war, serves as a de facto spokesman for the Pentagon, and has very close relationships with many top generals. One can only imagine what they've been telling him privately that they're too afraid to say directly to Defense Secretary Donald Rumsfeld. What Murtha has bravely done in Congress is simply voice what a majority of Americans feel about the military failure in Iraq and their desire to put an end to the death of U.S. soldiers. We hope his actions strongly urge Democrats to take his side, and convince some Republicans as well that it's time to start demanding of President Bush that he outline a coherent and imminent exit strategy. Perhaps this is the tipping point on Iraq that we've been waiting for. And we also hope once and for all that the GOP's attack and smear tactics backfire and cause even further damage to an already struggling and scandal-scarred party in which voters have lost faith. It is reprehensible and bordering on treasonous to attack for political purposes the bravery, patriotism and military service of distinguished war heroes like John Kerry, Max Cleland, John McCain and John Murtha. It's even more despicable when it's done by a bunch of draft-dodging Republican cowards who've never stepped into a military uniform. "I like guys who've never been there that criticize us who've been there," Murtha said. "I like that. I like guys who got five deferments and never been there and send people to war, and then don't like to hear suggestions about what needs to be done. I resent the fact, on Veterans Day, he (Bush) criticized Democrats for criticizing them." The Bushies' bully-pulpit attack and smear campaign against anyone who disagrees with them is both un-American and ammoral. The tragic irony is that the neocons have our men and women dying in Iraq to spread Democracy and protect personal freedoms yet they are utterly clueless on how to promote the same liberties, freedom of speech, and right of dissent here at home. Did you mean to say that _McClellan_ never served? You say instead that _Hastert_ never served at the end of the McClellan paragraph. Otherwise, right on. Good lord, but that McClellan statement was some of the worst flailing I've heard from the White House in a while.